The best restaurant menu app. Sirved is the place to go to find nearby restaurants. 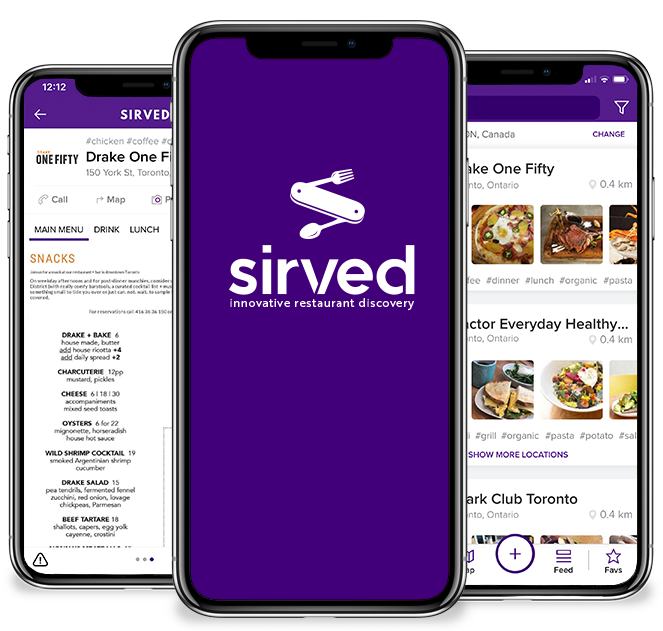 Since 2015 Sirved, the increasingly popular restaurant menu app, has listed the menus of more than 350,000 of the most interesting and popular eateries in North America. We think we offer the best ‘foodie app’ around. Anyone who loves food and wants to find the best ‘food near me’ in towns and cities right across the continent just needs to make their way to Sirved. You’ll be surprised and excited by what we have to offer. Our restaurant menu app will change the way you look for restaurants that feature just the kind of meal you’re after no matter what kind of local restaurant meal you crave. OK, so what’s the big deal you say? There are lots of restaurant apps around and you may be right about that. But not one of them offers the comprehensive restaurant menu app that you’ll find on Sirved. We quickly give you the complete menu selection from all the nearby restaurants in town. We’ll give you an exact list of the all the local restaurants that offer the very menu item that you’re after. The Foodie App for Folks Who Know Exactly What They Want to Eat. So how does Sirved work? First of all, our restaurant menu app is free, to both restaurateurs, and to the hungry public. In the world of restaurant menu apps we’re unique. We list almost every eatery, diner, and café and their menus. Now, who else can claim that! We’re available on both iOS and Android. You can download us from the App Store and Google Play Store. If you own a restaurant and want us to list your menus get in touch through our website, email us at info@sirved.com or give us a call at 1.844.747.8331. We’ll be glad to hear from you. We’ll list all your menus on our site for free. But we also offer an excellent program that will increase your customer base and improve your bottom line. This inexpensive program will give you the diagnostics that lets you know what’s hot, and what’s not, on your menu, and in other local restaurants. We track what many restaurant customers are looking for. This can help you tweak your menu to reflect popular demands. Our diagnostics have turned struggling nearby restaurants around and helped successful ones reach new levels of success. The folks who use our app always want to know about a certain type of menu item of food near me. When you list with us, we help to get those new customers to your door. And that’s why many restaurant owners, and hungry customers alike, think that Sirved is the best restaurant app around. But you don’t own a restaurant and you’re hungry and you’re looking for an eatery that features exactly the type of food you’re after. Our app takes the ‘hit and miss’ approach out of selecting a restaurant. You want the closest place with your kind of food near me? Let’s say you’re in a strange town while on a business trip and have a desire for a good Indian meal with excellent curry dishes. Fire up your phone, go to Sirved and type in the town you’re in. Next, you’ll get results. What cuisine do you want to eat? Austrian, Chinese, Ethiopian, Mediterranean, Hungarian, Mexican, American we list them all. What could be better? Thousands of our customers know that we offer the best restaurant app on the market. As an active hungry foodie, Sirved will get you to the nearby restaurants where you need to be. The Best Restaurant App for Finding Nearby Restaurants. Bujold is another happy customer: “Love this app. It’s my first choice when trying to decide where to eat. Great for travelling or discovering new favourites in my area. So, when it’s time to eat out and you’re looking for a specific craving, there’s no better place to head than Sirved. Try us. We’d love to have you visit and we know you won’t be disappointed. The next time you’re wondering, ‘where do I find the best food near me’ the answer is as close as your smart phone.